At Harman Direct you can typically save a ton of money on its premium audio equipment by buying factory recertified products at a fraction of retail. 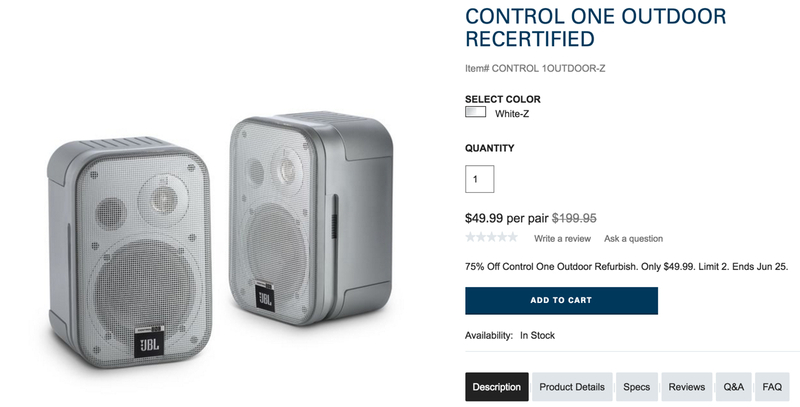 While there is a wide variety of headphones, Bluetooth speakers and other audio equipment, today we have our eyes on the JBL Control One 4-inch indoor/outdoor speakers (refurb) for $49.99 shipped. That’s $150 off the original list price, $41 less than Amazon for a pair in new condition and the lowest we’ve seen for them. Get ready to take advantage of full-range audio with a low profile outdoors. These speakers are weather resistant and can be mounted to a variety of surfaces. With a 4-inch woofer and a 1/2-inch titanium-laminate tweeter, they offer a smooth frequency response from 80Hz to 20kHz. Rated 4.2/5 stars from Amazon shoppers and covered by Harman’s 30-day return policy plus a 1-year warranty as well. You can have the world-famous JBL sound anywhere you want it: tucked away in a bookshelf, on your desk, in the kitchen, in a home theater or studio, up on a wall or even as part of a multiple-room home music system. The JBL Control One speakers are ready for all of these places and can even handle the outdoors thanks to their weather-resistant, UV-resistant construction. The rugged, compact speakers feature a 4-inch (100-millimeter) woofer and a 1/2-inch (12-millimeter) titanium-laminate tweeter for a smooth frequency response of 80Hz to 20kHz. They have a peak power-handling capacity of 200 watts. If you need big, accurate, full-range audio with a low profile, this is your answer.